Babywearing Groups in New Zealand – Spotlight on Slingbabies. In the lead up to New Zealand Babywearing Week (Oct 10 – 16, 2011) we will be featuring the babywearing groups that run meetings in New Zealand. 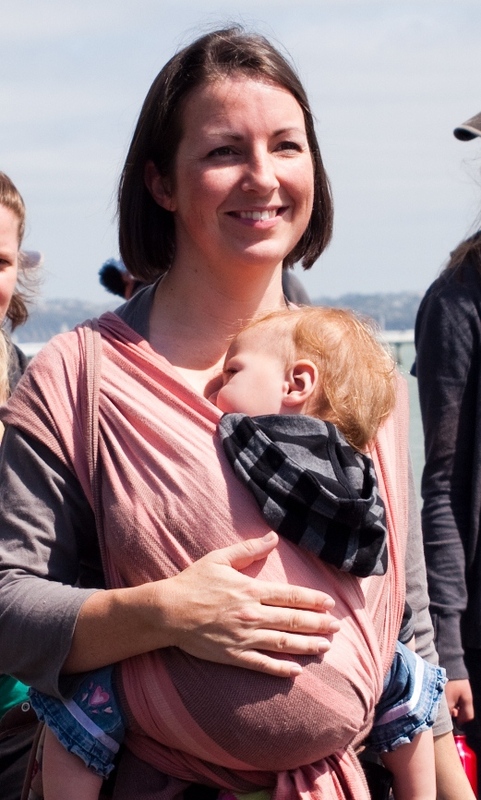 The original babywearing group in New Zealand is Slingbabies which operates in Auckland and was founded by Jessica Richards. Jessica’s initiative has inspired the formation of babywearing groups in other areas of New Zealand and we’ll be featuring those groups too over the next few weeks. When did Slingbabies get started and why? Slingbabies started in May/June 2007, because I was answering the same questions constantly on online forums. I held a meeting at my house which only two people came to (started small!). Now we regularly have over 20 people each time. I started the website in November 2007 as a central place to store all my information. When and where are your meetings? We meet on the first and third Fridays of the month, at the Sturges West Community House, 58 Summerland Dr, Henderson. Our SouthEast branch meets on the 3rd Sunday of the month 1.30-3.30pm, at the Anchorage Park Community House, 16 Swan Cres, Pakuranga. What happens at a typical meeting? I do a little history and general blurb at the start, then go through the 5 types and their carry methods. In the second half of the morning we do the try-on session, people can loan out carriers then. I’m pregnant but interested in Babywearing, can I still attend meetings? Absolutely! We love getting pregnant mums coming along. It is good to get an idea of what’s out there. Unless you are going to make your own cheap wrap or similar, I recommend waiting to purchase till after you’ve seen us with your newborn and tried some. Often babies have different ideas of what they like than we do! Are baby carriers available to hire from a lending library? If so, how does the lending library work? We have an extensive library. For a $20 joining fee and $5 per sling loan, you can borrow a carrier for 2 weeks and bring it back to the next coffee morning (on the 3rd Friday) which often works out well. SE Slingbabies also has a carrier library, but you need to arrange return with Heather. Who organises and hosts the Slingbabies meetings? I organise and host them, with the help of my team and some great regular ladies also. Heather runs the SE Slingbabies branch, we are lucky to have such an expert to take care of that group. We run on a shoestring so we appreciate any help and donations we can get. How can people get in touch with the group? Find us on Facebook, or contact Jess via the Contact Us page on the Slingbabies website. This entry was posted in New Zealand Babywearing Groups and tagged NZ Babywearing Groups, sling library, slingbabies. Bookmark the permalink.